Vietnamese goods exported to Cambodia managed to remain at a growth of 30 percent a year, while the country’s overall export market suffered a decrease. The conference on border trade cooperation and development between Vietnam and Cambodia, held recently, mainly discussed how to maintain the two-way trade growth between the two countries with a focus on strengthening that partnership over the next ten years. According to Vu Huy Hoang, minister of the Ministry of Industry and Trade, Cambodia is an important and potential market for Vietnamese goods as the two countries share a border of 1,137 kilometers that goes through 10 Vietnamese provinces and 9 in Cambodia. There are 10 pairs of international border gates, 12 pairs of main border gates, and 25 secondary gates along the border. In addition, there are many trails, which facilitate trade between the two countries. Vietnam and Cambodia share several similarities in terms of local customs and consumer demand, which benefits Vietnamese firms in the exportation of goods. Many Vietnamese consumer goods groups, including cosmetics, instant noodles, plastic products, and fertilizers account up to 50 percent of market share in Cambodia. Meanwhile, Vietnam mainly imports materials for manufacturing. 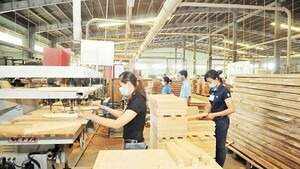 Vietnam has great structural advantages in the exportation of goods to Cambodia. However, as for now, the neighboring country is merely a potential market. According to Tran Huu Duc, foreign relations director of Nutifood, through goods fairs and mass media, the percentage of Cambodian people, who know about Nutifood’s dairy products, has recently risen. However, as the applied tariffs for dairy products have risen to 35 percent, Vietnamese firms primarily sell products into Cambodian markets by unofficial cross-border trade, taxed at just 10 percent. On the other hand, the cost spent to sell Vietnamese products in the supermarket system is rather high, creating an unsolvable puzzle for Vietnamese firms. Sharing the same opinion, Lai Quoc Doan from plastic company Dai Dong Tien, added that Vietnamese goods have an important position in Cambodia, especially plastics. Nevertheless, many firms remained hesitant because of complicated administrative procedures, unclear customs clearance, and high tariffs. Besides the import tariff of 7 percent, and value added tax of 10 percent, firms have to pay an import fee of US$120 per time. This combined with a customs declaration fee of US$200 per container, makes the exportation rate too high for a batch of goods valued between US$16,000-US$18,000. Pham Le Huynh Mai, representing the instant noodles company Colusa-Miliket, said exporting a batch of goods to France by sea costs only $85, while to Cambodia by road costs them up to $95. High cost has increased the price of a case of instant noodles by at least VND20,000. The Ministry of Industry and Trade expected that revenues gained from trade with Cambodia possibly reached $2 billion this year, and would rise to $7 billion by 2015. Cambodian trade minister said statistical figures hadn’t reported exactly the actual turnover between the two countries, as unofficial cross-border trade was much higher. Firms said Vietnamese goods would likely dominate Cambodia’s market if the country offers them favorable policies about taxes and fees, issues laws to protect them, and helps them maintain updated information concerning evolving markets.